It is Monday morning, and while many of us science majors are dreading the 9 AM hike up Science Hill, Melissa, known as “Momo” to her friends, is excited. And why shouldn’t she be, when she has gorgeous waterfalls and beautiful rainforests to look forward to? Melissa Chiasson, DC ’11, is one of the 10% of Yale students studying abroad this year. In her junior year, Chiasson is taking advantage of the Yale Junior Term Abroad system to explore the Wet Tropics of Australia in the Rainforest, Reef, and Cultural Ecology program, part of the School for International Training (SIT) Study Abroad Australia. 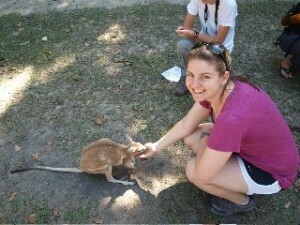 The two-month long program in Cairns, Australia includes one month in the field and another month of independent research with a professor in Australia. These days, in addition to swimming, hiking, and having fun with the fifteen other students in the program, Chiasson con­ducts ecological surveys, examines different types of vegetation, and attends mini lectures in the field. “We talk about what we’re seeing in the surrounding environ­ment. I’m learning to think more actively, which is a basic and necessary skill for any scientist. Before, I could see a forest and see that it was changing, but now, I see it and I also ask: why is it changing?” Chiasson said in a phone interview. And ecology is important to Chiasson, an Ecology and Evo­lutionary Biology (E&EB) major. After a life-long love affair with science, she realized that what she was most interested in is how we can use evolution and ecology to solve problems in disease and public health. Last summer, through the Howard Hughes Medical Institute International Scholars Program, Chiasson was able to spend the summer in Granada, Spain, working on illuminating the molecu­lar mechanisms of the African sleeping sickness parasite, Trypana­soma brucei. Few labs work on diseases that mainly affect develop­ing countries because of the smaller market for pharmaceuticals, but that is exactly the kind of research Chiasson is interested in. That summer abroad also allowed Chiasson to put her Spanish skills to use and to experience a different culture, both inside and outside of the lab. At Yale, Chiasson conducted research in the laboratory of Paul Turner, Associate Professor of Ecology and Evolutionary Biology. Working with the vesicular stomatitis virus system, Chi­assaon investigated the relationship between non-protein-encod­ing cheater viruses and the coinfecting, protein-encoding viruses these cheaters exploit. She was also busy as an editor for the Yale Record and a volunteer for the Peabody Museum. Chiasson knows she wants to pursue a Ph.D. in Evolutionary Biology, but she wants to take some time off before graduate school to explore further her true interests. Ultimately, she hopes to be able to treat diseases using her background and research in evolution. Melissa Chiasson, DC ’11, is one of the 10% of Yale students studying abroad this year. In her junior year, Chiasson is taking advantage of the Yale Junior Term Abroad system to explore the Wet Tropics of Australia in the Rainforest, Reef, and Cultural Ecology program, part of the School for International Training (SIT) Study Abroad Australia.